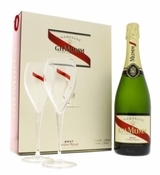 G. H. Mumm & Cie. APPEARANCE This champagne is a brightly sparkling, light golden yellow liquid with an abundance of fine and elegant bubbles. FRAGRANCE The nose reveals initial aromas of ripe fresh fruit (white and yellow peaches, apricots), tropical notes (lychee and pineapple). It then opens up with the fragrance of vanilla before developing notes of milky caramel, breadcrumbs and yeast, culminating in aromas of dried fruit and honey. TASTE An explosion of freshness in the mouth, followed by strong persistence. The complex aromas of fresh fruit and caramel perpetuate the intensity.